Bloomsburg University is a great place to be you! Costs total about $8,903 per semester for tuition, fees, room and meals for Pennsylvania residents and about $14,312 per semester for nonresidents. Add about $500 for books and classroom materials. More than $1 million in scholarships are awarded annually. Other support includes loans, grants and work-study. About 90 percent of students receive some form of financial aid; the average amount of aid is $10,000 per year. 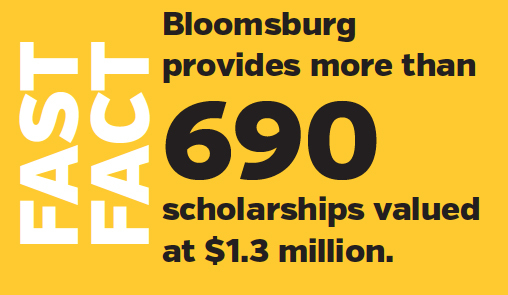 Bloomsburg University’s tradition is based on doing more than just what’s required. It’s based on going the extra mile, taking the extra step. We don’t just “train” students — we help them define their interests and ambitions. Our faculty are here to offer the guidance students need to chart a path toward realizing their goals. Students have abundant opportunities here on campus to hone and develop leadership skills and creative talents. They can explore internship possibilities, pursue undergraduate research projects with faculty and engage community service projects. All of these experiences help students stand out to future employers. 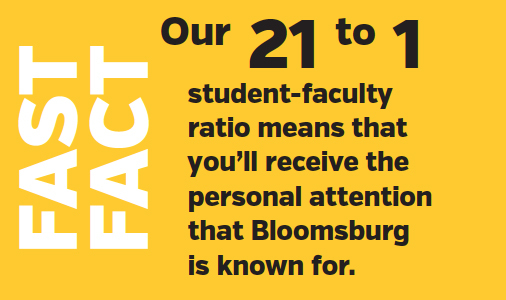 Bloomsburg University understands the power of the network — 80 percent of all jobs are found through networking. Our students have plenty of opportunities to tap into the Husky network of 60,000 alumni and dozens of business partners. In addition to academic courses, our Professional U initiative gives students the chance to take part in experiences that build professional skills each year through their college career as freshmen, sophomores, juniors and seniors. Parent Connection — updates regarding student life, as well as meal sign ups, direct deposits, loan, scholarship and grant information. On-Campus Housing — updates regarding move-in dates and times, housing deposit and payment due dates, and more. Emergency Notification System (BU Alert) — system designed to send text, voice and email messages to compatible devices in the event of an emergency situation. A student’s MyHusky emergency contact information is specifically NOT included in the BU Alert system, by default. Students can log into BU Alert and add any cell phones and voice numbers they want to use to receive alerts, such as parents' cell phones. When mailing a package to your student, you must include the mailbox number and name of residence hall to be considered a complete campus address. An incomplete address will result in delays or complete delivery failure. Bloomsburg is an easy drive from many metropolitan areas, including Philadelphia, New York City, Allentown, Wilkes-Barre, Scranton and Harrisburg.